Lightning Droplets is one of the very first blogs I started to follow. The posts never fail to inform and inspire. I encourage all writers to latch on to this good thing and click “Follow” at the Lightning Droplet site, after you read this post. What you’ll find with Lightning Droplets is good writing about writing. Enjoy. 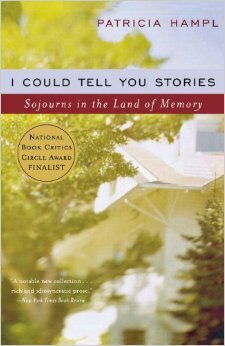 Patricia Hampl’s I Could Tell You Stories: A Sojourn into Memory is a thoughtful, compelling book. Twice as I was reading it, I felt an overwhelming urge to put down the book and write. Both times the writing and feelings were so moving that I was brought to tears. It is a gathering of thoughts and questions on memory and memoir. I will admit, I am skeptical of memory and wary of memoir. To me, memories are so malleable, so constructed (See Radio Lab’s episode on Memory and Forgetting.) that I’ve never felt that I could trust them as a source of truth in writing. And as much as I’ve been wanting to write more nonfiction, I cringe at the idea of writing memoir. Isn’t it just navel-gazing? Aren’t there some truths that are better portrayed through fiction?